White, feathery flowers cover bare, gray branches. 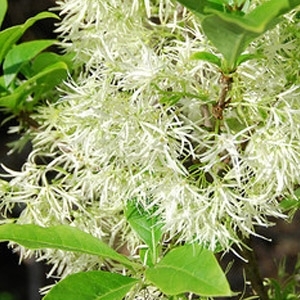 Blooms in late spring for roughly about 2 weeks, after most other flowering trees & shrubs have finished flowering. Grancy Greybeard has a delicate, sweet, almost lilac scent, especially in the evening. Fall foliage is bright yellow; deciduous.